Dial-Up VPN Password Recovery is designed for Dialup, VPN (Remote Access Connections) password recovery. It can recover lost or forgotten passwords for the saved RAS settings. It start working just after the startup. Just run the password recovery tool and you will get whole RAS settings and passwords. 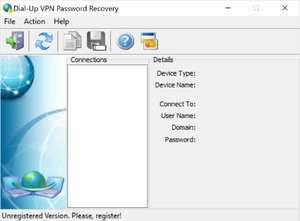 Dial-Up VPN Password Recovery 2.1.7.8 is a shareware program and can be used as a demo to try the software until the free trial period has ended. A full version of the program is available after the trial period ends. For security reasons, you should also check out the Dial-Up VPN Password Recovery download at LO4D.com which includes virus and malware tests. Additional screenshots of this application download may be available, too.